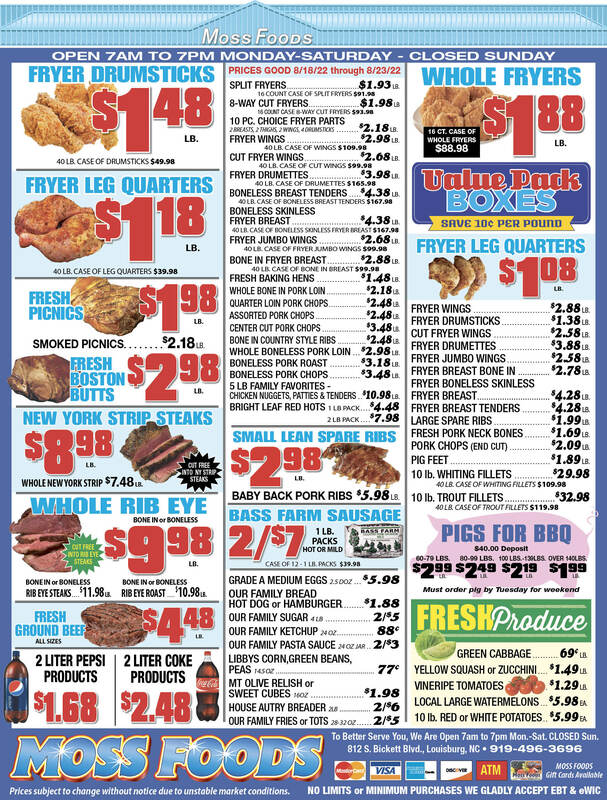 Showing 56 articles from August 14, 2013. RALEIGH — A Franklin County woman who has kept in step with the Civil Rights Movement for decades is the face of an NAACP lawsuit accusing the state of voter suppression. The state Conference of the National Association for the Advancement of Colored People filed a complaint Monday in the U.S. District Court for the Middle District of North Carolina, alleging that Gov. 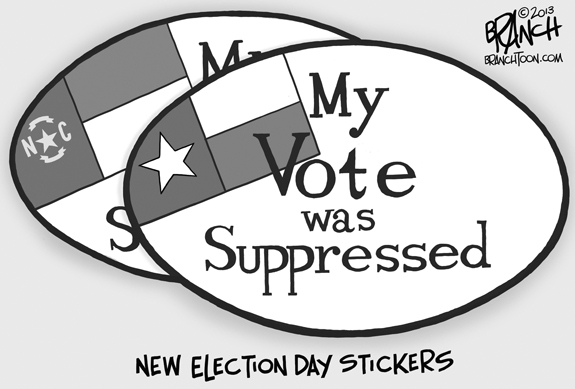 Pat McCrory and the state Board of Elections took actions that place discriminatory electoral burdens on large segments of the population, particularly African Americans. That was the consensus of a survey of 241 community residents and 175 school staffers that was completed as the board of education searches for a new superintendent following the mid-summer retirement/resignation of Dr. Eddie Ingram. 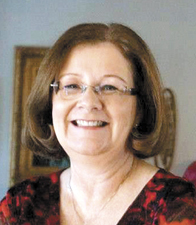 Rosemary Champion is the newest member of the Franklin County Board of Education — or, at least she will be after she is sworn in at the board’s Sept. 9 meeting. 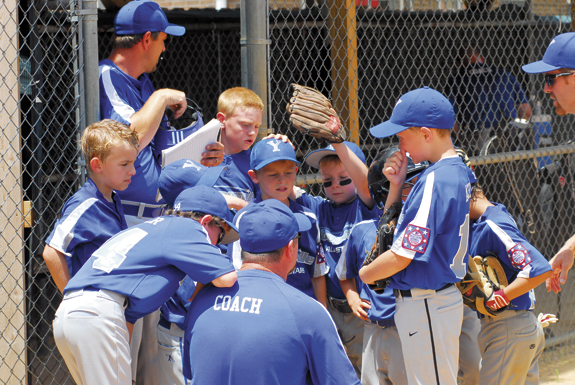 YOUNGSVILLE — This past season, seven Youngsville youngsters took advantage of the parks and recreation’s baseball program. It cost the town $40,000 to administer the program. Town staff and officials said they don’t want to take a bat out of any slugger’s hands, but they’re not so sure if they should keep digging into taxpayers’ pockets to fund a program that is primarily used by youngsters and parents outside of the town’s corporate limits. LOUISBURG — A medical collaboration designed to give the sick a more stable health care home ended this summer. A loss of funding and an underlying difference in culture ultimately concluded the venture between the Franklin County Volunteers in Medicine and the county Health Department. “A nonprofit and government partnership is doable,” said Dr. Phillip Stover, the free clinic’s medical director and chair of the board of directors. Is elementary school security important? Really? 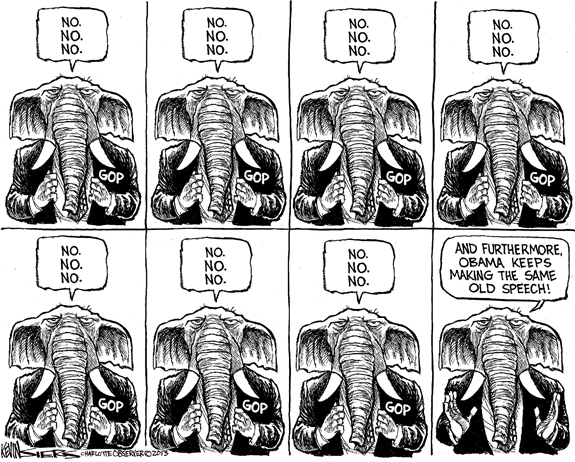 ... What we’re counting will be clear in a minute. But at Monday night’s Franklin County Board of Education meeting, statistics were presented that, while unsurprising, were quite troubling. They indicate that school safety — for students and staff — was rated as a top concern by members of the Franklin County community who participated in a survey about selecting a new school superintendent. A long-simmering problem in Franklin County is again coming to the surface but it’s likely that finding a workable solution will be more difficult than negotiating the Israeli-Palestinian solution. The problem is simple to define — and the Youngsville town board did just that last week. In February 2010, then Clerk of Court Alice Faye Hunter walked into the commissioners meeting room, telling them that a Louisburg man had left the county about $1 million to build a park. All Edgar Owens wanted was for the park to be named after his parents — the V.E. and Leila Owens Recreation Park. And, if money allowed, he wanted the park to have a pond — known as the V.E. Owens Fishing Hole. It seemed like a simple request. With the end of the first weekend of this month North Carolina’s back-to-school sales tax holiday ended forever courtesy of the Republican controlled General Assembly. The state picked up an estimated $14 million in revenue largely at the expense of the poor and middle class while simultaneously hurting many Tar Heel retailers. This indicates a sad lack of imagination. LOUISBURG - Evelyn Danzer, 85, died Tuesday, Aug. 13, 2013, at Franklin Regional Medical Center. Services will be private. FRANKLINTON —Mazie Wilder Wiggins, 73, died Monday, July 29, 2013. Funeral services were held Friday, Aug. 2, at First United Church of Christ, Franklinton, with the Rev. Douglas Wooten officiating. Burial followed in the Manasseh Chapel Baptist Church cemetery, Franklinton. LOUISBURG - Funeral services for Robert L. “Bobby” Hargrove, 69, who died Monday, Aug. 12, 2013, will be held at 3 p.m. Saturday, Aug. 17, at Mitchell Baptist Church, with the Rev. Daniel Lilly officiating. Burial will follow in the church cemetery. WAVERLY’S WONDERS. 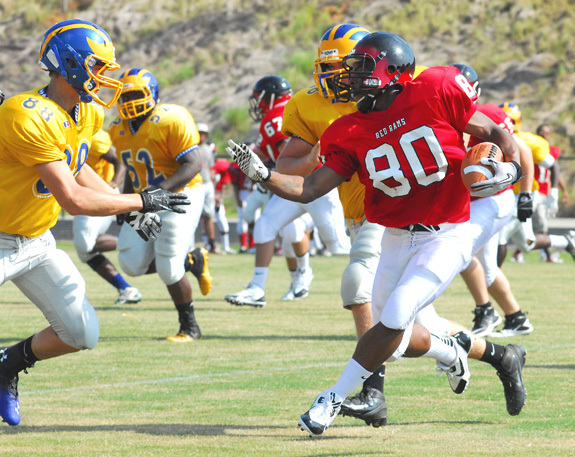 Franklinton High School receiver Mike Waverly (right) heads upfield after catching a pass during action against East Wake as part of the FHS Football Jamboree last Saturday morning. FRANKLINTON - Was the glass half-empty or half-full last Saturday morning for the Franklinton Red Rams? That’s what FHS head coach Jeremy Buck has been trying to figure out this week following his club’s performance at the Franklinton Jamboree. Taking on several strong area clubs such as Princeton, East Wake, Burlington Cummings, North Pitt and Northern Nash, the Red Rams displayed an impressive arsenal off skill-position weapons -- even though starters Rondez Taylor and Travon Judkins sat out for not having enough practice days in to be eligible for competition. HOLDING SERVE. 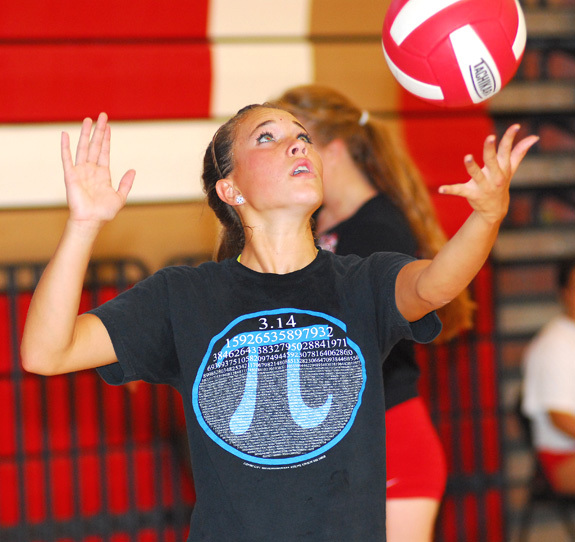 Franklinton’s Hannah Rayman works on her service technique during a recent volleyball practice session at the FHS Gymnasium. FRANKLINTON -- Last summer, Caitlin Withers didn’t have much time to prepare for her first season as the Franklinton High School volleyball coach. All of about one week, to be exact. But the adjustment proved to be a smooth one as FHS enjoyed one of its best campaigns in recent memory. LOOSE BALL. 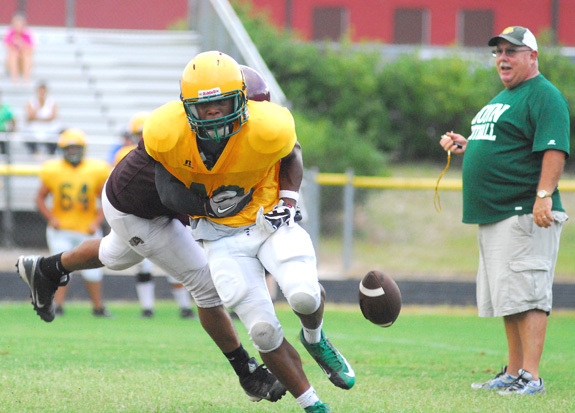 Bunn High School football coach David Howle (right) couldn’t have been happy about this fumble by BHS’ Darun Hodge while being hit as part of Tuesday night’s home scrimmage against Kevin Crudup’s Nash Central Bulldogs. 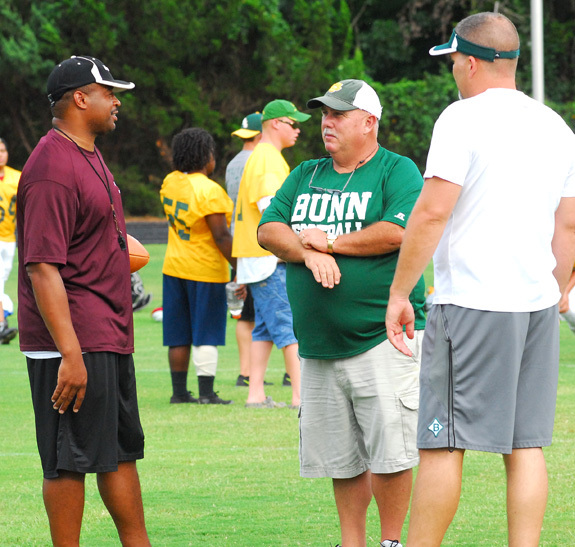 BUNN -- As it turned out Tuesday evening, the Bunn Wildcats would tangle with two opponents as part of scrimmage festivities at the BHS Football Field. A scrappy Nash Central squad was destined to give the Wildcats all they could handle, but Mother Nature would prove to be a formidable foe, too. 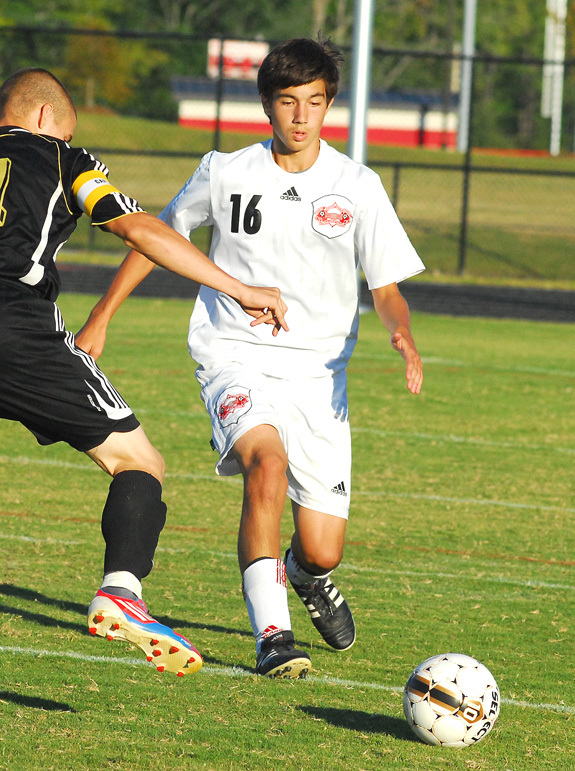 FRANKLINTON -- There will be no easing into the season this fall for the Franklinton High School boys soccer squad. 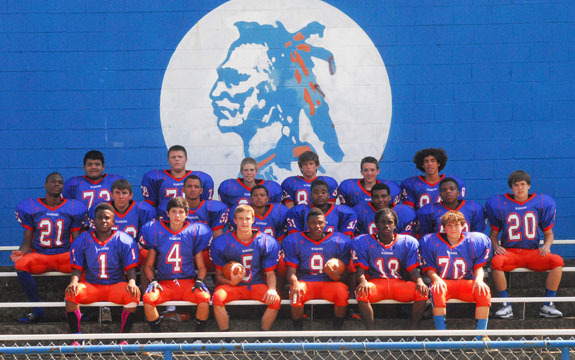 Instead, Franklinton’s campaign will begin Monday at home with a meeting against the touted Southern Nash Firebirds. Last season, Southern won the Big East Conference regular season and tournament championships before reaching the Elite Eight of the Class 3-A State Playoffs. SWEEPING HIM OFF HIS FEET. 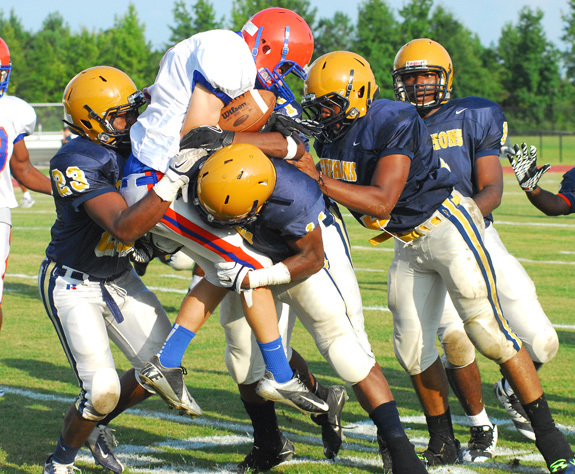 Several Rocky Mount High School defenders team up to tackle Louisburg’s Ron Roberson during Monday evening’s football scrimmage. 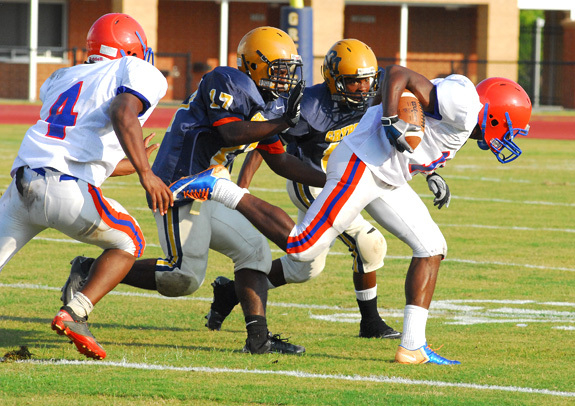 ROCKY MOUNT -- Defense ruled the day during the major portion of Monday’s prep football scrimmage between host Rocky Mount and Louisburg at the RMHS Field. The event provided a homecoming of sorts for LHS head coach Chris Lee, a former RM assistant who still resides in Red Oak. Wilson Fike at Bunn 7:30 p.m.
North Johnston at Louisburg 7:30 p.m.
Goldsboro at Franklinton 7:30 p.m.
WOODBRIDGE, VA. -- Bryson Myles saw his franchise-record hitting streak snapped at 23 games on Monday night as the Potomac Nationals shutout the Carolina Mudcats 2-0 in a Class A Carolina League baseball contest at G. Richard Pfitzner Stadium. Myles finished the night 0-for-4, reaching once on an error. 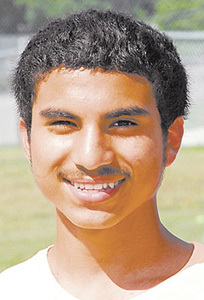 LOUISBURG -- Chris Cannady will serve as the boys soccer head coach this season for Louisburg High School as the Warriors make the move to the Class 1-A Tar-Roanoke Athletic Conference. LHS will have two league opponents -- KIPP Pride and Granville Central. FRANKLINTON -- True leaders can see opportunity in even the most adverse situations, but that’s usually a trait that comes with age and maturity. 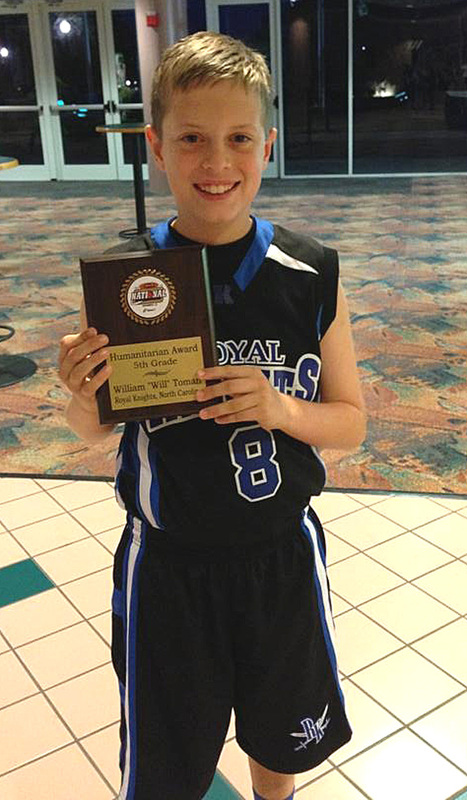 But not for Will Toman, who will be entering the sixth grade this fall at Cedar Creek Middle School. A member of the Franklin County Royal Knights Travel Basketball Program, Toman was dismayed when teammate Javion Webb lost his home to a fire earlier this year. BACKHAND BLAST AT LHS. Louisburg High School’s Catie Strickland goes to her backhand for a return during a recent practice session at the LHS Tennis Courts. 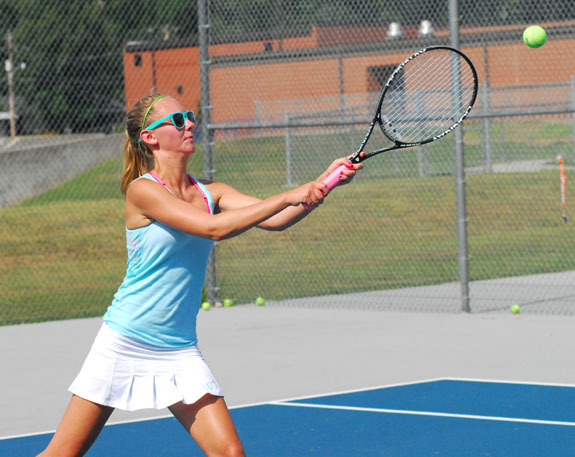 LOUISBURG -- When Johnathan Waugh took over as Louisburg High School’s girls tennis coach last August, he inherited a young team with only one player -- Casey Shellman -- with any sort of court experience. Working literally from the ground up while teaching the basics such as fundamentals and game scoring, Waugh helped develop the Lady Warriors into a respectable squad last season in the competitive Northern Carolina Conference. LOUISBURG -- Louisburg High School’s volleyball season return to the Tar-Roanoke Athletic Conference will begin Aug. 21 with a non-league road matchup at Rocky Mount. The Lady Warriors, coached by Erica Wammock, will be back in the Class 1-A TRAC following a four-year stint in the Class 2-A Northern Carolina Conference. RALEIGH -- The North Carolina Highway Patrol will host its seventh annual Patrol Stroll on Sept. 28 at the NCSHP Training Academy, which is located at 3318 Garner Road in Raleigh. The event will begin at 8:30 a.m. and will feature a 5-K Road Race/Walk, a 1-Mile Fun Run/Walk and a MADD Dash For Kids. 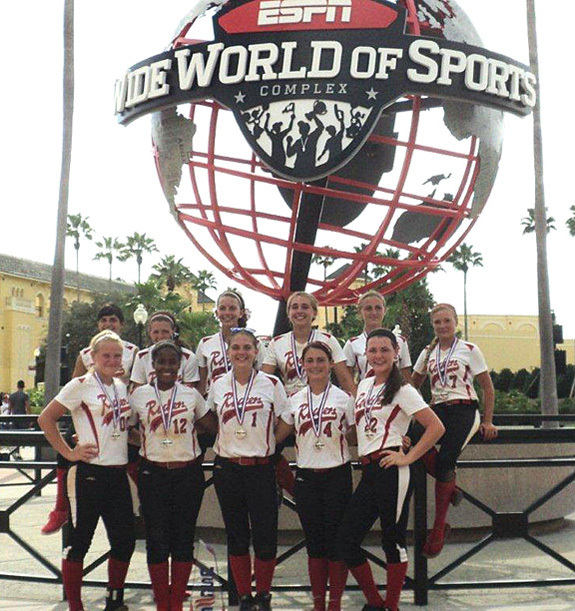 WAKE FOREST -- The Wake Forest Rockers 14-Under Team wrapped up its successful travel ball season in style this month by taking part in the USSSA World Series in Orlando, Fla. The Rockers claimed fourth place nationally and finished the campaign with a strong 68-16 campaign. For the year, the Rockers won eight tournament championships and finished in second place three other times. ROCKY MOUNT -- Since 1999, North Carolina Wesleyan College has honored 54 former athletes, administrators, teams, coaches and contributors by enshrining them in its Athletics Hall of Fame. These individuals have created a higher standard for Battling Bishop athletics and were selected based on their outstanding accomplishments and/or contributions to the College. Nash Central High School football coach Kevin Crudup (left) chats with Bunn coach David Howle before Tuesday’s scrimmage between the squads on the BHS campus. Crudup is a Bunn alum who played football under Howle. He is now a successful coach at Central and his brother, Cedric (another former BHS standout) serves as one of his assistants. 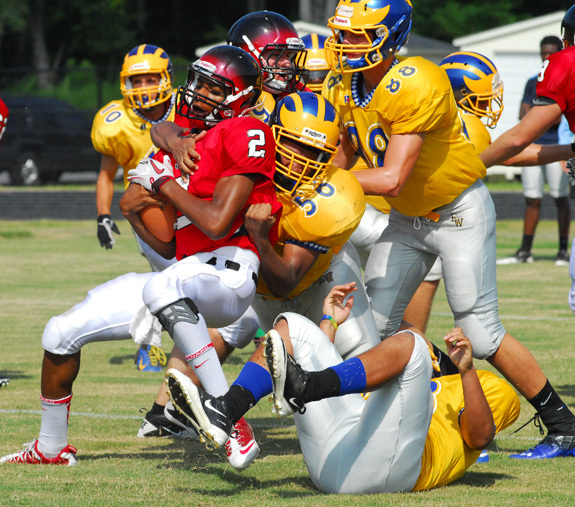 Franklinton senior quarterback Daquan Neal (with ball) is brought down by several East Wake defenders during last Saturday morning’s Franklinton HS Football Jamboree. Franklinton’s Jala Perry works on her setting technique during a recent volleyball practice session at the FHS Gymnasium. The Lady Rams will host Corinth Holders next Tuesday. 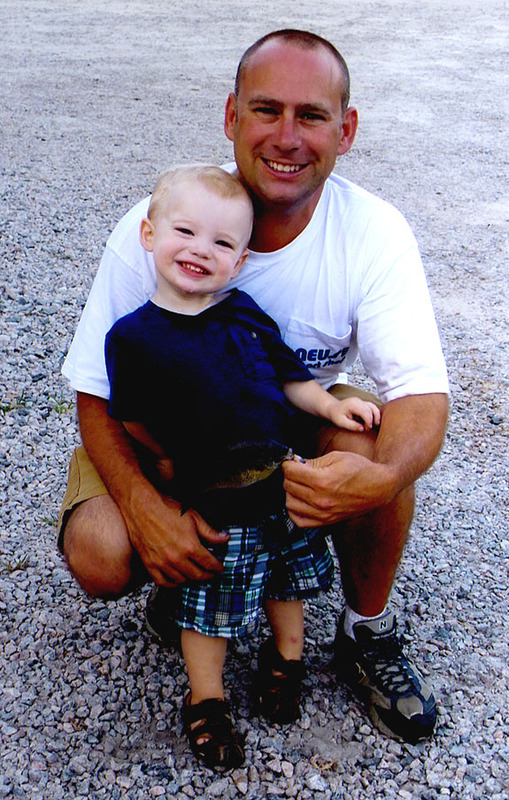 Two-year-old Rylan Bottoms poses with his father, Russell, after reeling in this bream during a recent fishing outing. 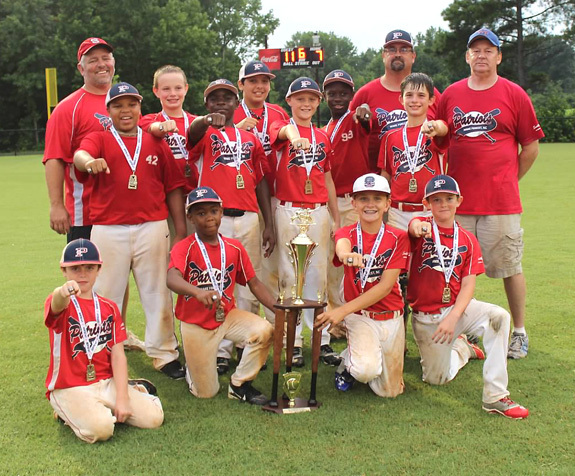 The Wake Forest Patriots 11-Under Baseball Travel Team proudly display their rings after winning the NC Game On Sports AAU World Series. 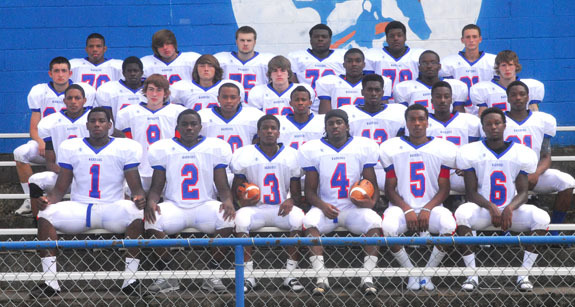 Several of the players on the squad are from Franklin County. Also this year, the Patriots won the Top Gun Spring National Tournament and finished in second place in the Gold Division of the Top Gun World Series. Louisburg’s Tyree Thorne (with ball) delivers big yardage for the Warriors during Monday’s road scrimmage against the Rocky Mount High School Gryphons in Nash County. 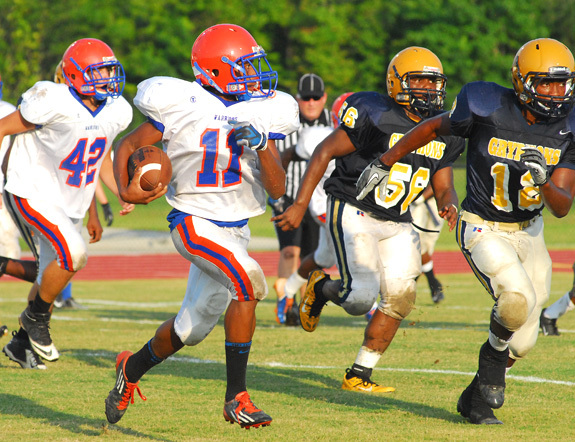 Louisburg’s Lakito Perry (right) maintains his footing during Monday’s scrimmage at Rocky Mount. 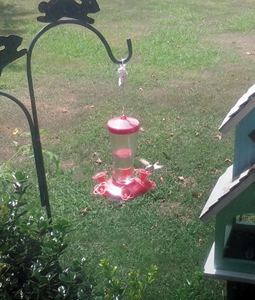 Hummingbirds are a fairly common sight in Franklin County during the warm summer months, but usually they have brightly colored plumage that glistens in the bright Carolina sunshine. Even the more drab females sport feathers that reflect the light. But this fellow — or was it a gal? — is virtually all white. Retired mail carrier Eddie Watson was relaxing recently while contemplating the wonders of the universe when something white flashed by. READY TEDDY. Donna Perry (left), Kim Crudup (center), and Norma Smithwick show off a “wounded” but recovering teddy bear during their visit to St. Paul’s. For 18 years, Donna Perry, emergency room nurse manager at Novant Health Franklin Medical Center, has traveled to kindergarten and preschool classrooms across Franklin County teaching children how to play safely. 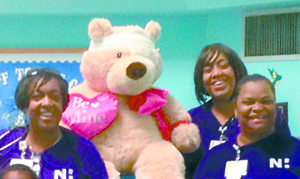 Recruiting other hospital employees to participate in “teddy bear clinics,” Perry has created a learning opportunity that engages students, teachers and Novant Health employees alike. Fall lawn care season: It’s just around the corner! If you have a fescue lawn, then you have been fortunate this summer due to all the rain we have experienced. Often, our summers are hot, dry and humid which leads to thinning fescue lawns. However, this summer we have had plenty of rain and not many temperatures above 90 degrees. The rain has also made the crabgrass grow very quickly. 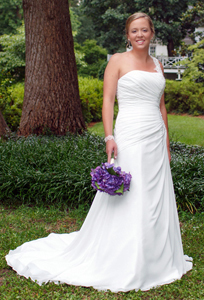 Jessica Walker Person and Christopher Alan Baker were married July 27, 2013 at 2 p.m. in Smyrna. The Rev. Bill Hooper officiated the ceremony at the Smyrna Pentecostal Holiness Church. A reception followed in the church fellowship hall. Dorothy LeMay and Jeffrey and Jewell Kearney announce the upcoming marriage of their daughter, LeShaunda Kearney to Tavares McCotter, son of the late Earl and Loretta McCotter. LeShaunda is a native of Franklinton. 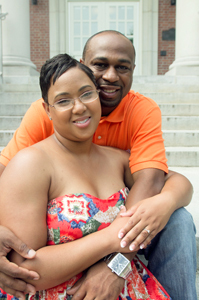 The wedding will be held in Greenville on Sept. 29, 2013. Free Negroes, though few in number relative to the entire population, had an impact on the development of Franklin County prior to the Civil War. Many of them worked as farm laborers, but some pursued important crafts. A few possessed real or personal property, and at least two in 1860 —John Hogwood and Thomas Blacknall—owned slaves. 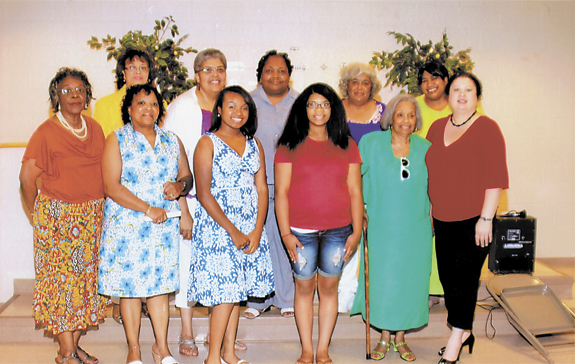 The Nu Epsilon Chapter of Alpha Pi Chi National Sorority, Inc. held its annual Rainbow Tea recently in the Interdenominational Ushers Headquarters Building in Franklinton. Scholarship winners were recognized at this event. Mistress of ceremonies was Etta Alston-Burgess. Jane Williams delivered the welcome and Jeanette Richardson reminded attendees of the significance of the rainbow. Geraldine Harris-Holloway blessed the food. RALEIGH — Wake County’s prosecutors office has proposed a way to dispose of the more than 900 cases of residents arrested during Moral Mondays. At least three Franklin County residents are determining how to resolve the matter. 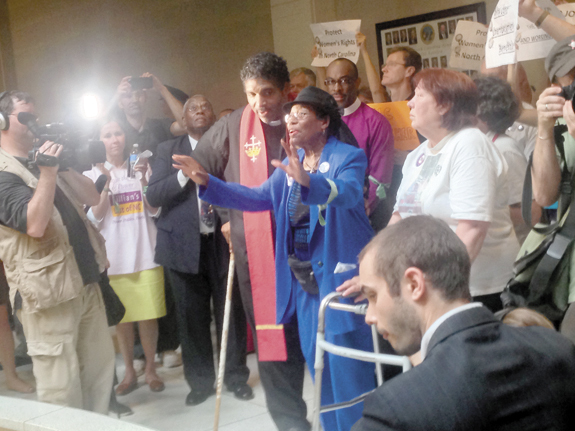 Armenta Eaton, Rosanell Eaton and Beverly Kegley were arrested for civil disobedience during rallies that took place at the General Assembly in June and July. HANGING AROUND. These steel beams are the foundation for offices that will be housed in a new hangar at Triangle North Executive Airport. 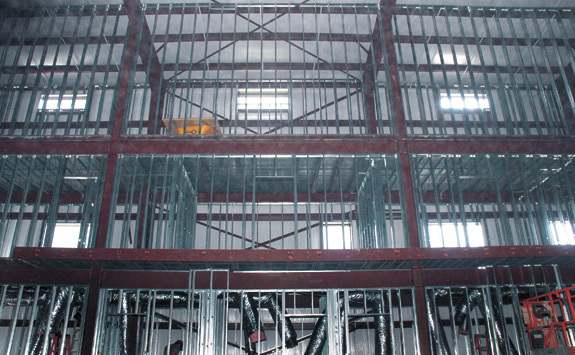 LOUISBURG — Contractors are about two months away from completing a hangar that will help the county’s airport grow — literally. Developers have already completed the outside of a 12,000-square foot hangar that Paul Fayard agreed to build at Triangle North Executive Airport. LOUISBURG — Franklin County staff and officials are waiting on an appraisal and assessment of a dam before they make any commitments to a new park property. In March, county commissioners decided they wanted to use an 80-acre tract on Dyking Road to build a new county park. A Youngsville area man is next slated to appear in court later this month on charges of sexually exploiting a minor. Jeffrey M. Botellio, 49, of Beechwood Drive, was charged this past weekend with felony sexual servitude of a minor and misdemeanor contributing to the delinquency of a minor. According to reports, Raleigh police allege that Botellio kept a 15-year-old girl from Washington, D.C. inside a hotel room, selling her sexual services. A Blessing Inc. recently celebrated five years of service to Franklin County. Five volunteers who have given of their time and talents were honored. 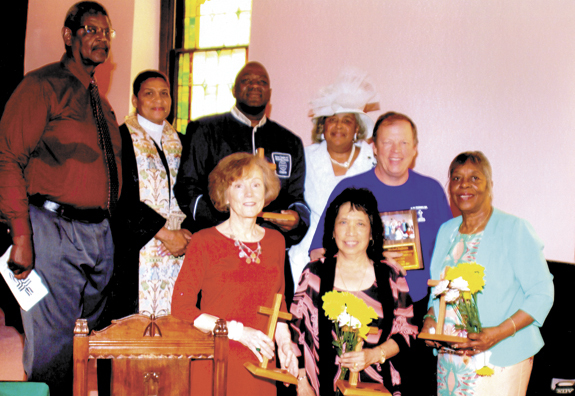 Pictured at the celebration (front row, left to right) are Hope Williamson, Ning Anton, Phyllis Perry; back row: Howard Young, Rev. Parker, Mark Williams, Geraldine Manley and Mike Anderson, president. A Louisburg family escaped harm last week when their home in Justice caught fire. A woman and two children were at the property, but were not injured in the fire. The Alston-Pleasants Post-Graduate Scholars Fund trustees have announced that Dennis Wayne Organ has contributed $50,000 to the graduate and professional studies fund. Organ, who was a University of North Carolina undergraduate Alston-Pleasants Scholar from Roanoke Rapids, is an Indiana University School of Business professor emeritus of management. AWARD CEREMONY. In a recent ceremony of Bestowal of Military Awards held at Maple Springs Baptist Church, Louisburg, John Kenneth Weaver, United States Navy, USS Cabot, FN-Fireman Naval Basic Training Command, was awarded a Certificate of Appreciation on his Confederate Ancestor, Delano Husted, 5th Alabama Artillery, CSA. 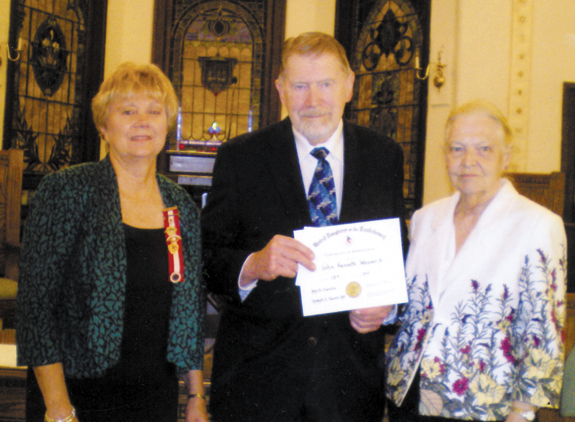 Amy Southerland, Chapter Recorder of Military Crosses (left), presents the certificate to Weaver (middle) with his wife, Pat Weaver.